It’s just a small story really, about among other things: a girl, some words, an accordionist, some fanatical Germans, a Jewish fist-fighter, and quite a lot of thievery. . . . Set during World War II in Germany, Markus Zusak’s groundbreaking new novel is the story of Liesel Meminger, a foster girl living outside of Munich. 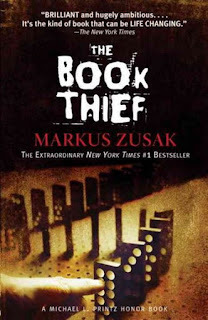 Liesel scratches out a meager existence for herself by stealing when she encounters something she can’t resist–books. With the help of her accordion-playing foster father, she learns to read and shares her stolen books with her neighbors during bombing raids as well as with the Jewish man hidden in her basement before he is marched to Dachau. This is an unforgettable story about the ability of books to feed the soul. For this one I feel I must start from the beginning. I purchased this book a while ago when I found it on a list of WWII fiction. Time and time I tried to start it but I couldn't get going. I couldn't figure out what was going on and soon abandoned it. I never thought it was a bad book or anything, I just wasn't sure if I'd like the style and wasn't convinced I could handle it for the entirety of the book. Then I started book blogging and saw positive review after positive review. Then came the Holidays and a well-deserved break. I decided that this was the time for The Book Thief and it was just so fitting. Though the book starts off a little off-kilter, it quickly settles down and I settled in for a wonderful read. This is a story of many stories centered around Liesel, her best friend Rudy, and her foster family. We see them get into and escape scrapes. They also have to face the reality of war. Give it a few pages before giving up on it. This is not the type of book where you turn page after page in anticipation. This story and the wonderful writing is something you savor. I often found myself pausing and rereading. There is just so much impact. It will make you laugh out loud, it might make you cry, but it will certainly make you think (but not too much). I loved the characters but I loved hearing the story told Death most of all. Having the story told from his point of view is pure genius. His observations during a great war cannot be matched. Liesel is so spunky and Rudy touched my heart. Everything is just so creative. At the end I felt like this was a story unlike any other. I couldn't help but be impressed by Mr. Zusak's imagination. It can be an emotional read. It isn't too serious for the most part but it can be sad. I felt like I knew Liesel at the end of the story. I felt like I understood her. When I close this book, I felt like I had lost a friend or two. I as just that connected to the story and the characters. It is simply wonderful. Some people don't read WWII fiction because they feel that it is too depressing or sad? Most of them aren't. What are your thoughts on fiction with a war time period? It worked really well and I rarely like formats like this so it was a pleasant surprise. I've heard fabulous things about this book, of course, but I haven't made my way to it... perhaps because I do prefer those "sit on the edge of your seat" type of books. This one seems important, though, so I really should make an effort to pick it up. Thanks for your thoughts! It's very very different but so worth it. It really is a unique story and it is told in a unique way. I can understand that. It definitely isn't one of the lighter reads available (or even close). It is really really interesting so if you get in the mood, you should give it a try. Oh just give it a couple of pages because the narrator being death makes it a very different read. I'm trying to broaden my horizons as well and it makes the year feel so exciting because I don't know what is to come. Thanks! I hope you get around to reading it. Thanks! I'll definitely head right over. She is. This book is just so hard to describe and review. It is so different and wonderful and sad at the same time. I bought this book like three or four years ago but I never did finish reading it. I found it a bit dense and I was dealing with something personal at the time that was just too emotionally draining to enjoy this book. I've always meant to go back but I just never been able too. Alexis, I'm so glad you enjoyed it! It's one of my favorite books and Liesel is definitely one of my favorite characters ever. So good! War books can be sad and overwhelming, but I can't get enough of them, particular those about WWII. There's just something about that period that fascinates me. I had the same experience with The Book Thief. I had trouble getting into it but after a few pages, I was hooked. It's one of my all-time favorite books! Will link to your review on War Through the Generations. Great review. You know, odds are, I wouldn't read a book that takes place during war time. But the fact that there's a POV from Death in this book would make me want to pick it up. I would give this a try, simple because you gave it such a great recommendation. Ordinarily, I wouldn't read war fiction or war historical fiction. But this sounds like a refreshing read. Plus, I'm trying to broaden my reading prospects this year and give more books a chance that I normally wouldn't read. I have heard so many good things about this book. I think I need to hunt for a copy. Thanks for the heads up. Great review. I still have not read this one! But to my defense, I did try, but gave up. Maybe it just is not the book for me in the end. This is one of my favourite books! It's an amazing story that tells of war with humanity and spirit. Liesel Memenger is one of my favourite characters, I think she's absolutely adorable. Haha. I know the feeling. Definitely not bad Precious. I've heard amazing things about this one but I never really paid attention to it.. *bad Precious* but I will now! Great review! It truly sounds amazing! I have been really wanting to read this. I almost started it last year, but I got sidetracked to something else. For me, the best sign of an awesome book is getting that feeling of having lost a friend once it's over. Great review. It is such a weird writing style and I kept asking myself where it was going but once I got it was good. It was the reviews that made me keep trying. This is an awesome book. So glad you liked it as well. Its such a unique perspective to write a book. I've had a really hard time starting this one, too. It's been on my tbr shelf FOREVER because of this reason. However, like you, I've read positive reviews of the book. And that it's also very emotional and intense. I have to read it one these days. Great review! Thank you! I wish we read books like this in High School. And I hate to say this but this one is a bit more depressing than the norm. But if you decide to give it a try, just know that it doesn't read as depressing. It is very young adult antics in a trying time but bad things do happen. I tried multiple times and gave up so I understand. It is so different. I think it grows on you and it starts to work but it took a while. I just made up my mind to read it and not stop and it worked. But it has a very different style. This book blew me away. I loved how the author depicted Death, especially with all the colors. Books about WWII are always difficult books to read, but I feel like I get so much out of them at the same time. I ADORED this book when I first read it back in high school. It was such a beautiful story! 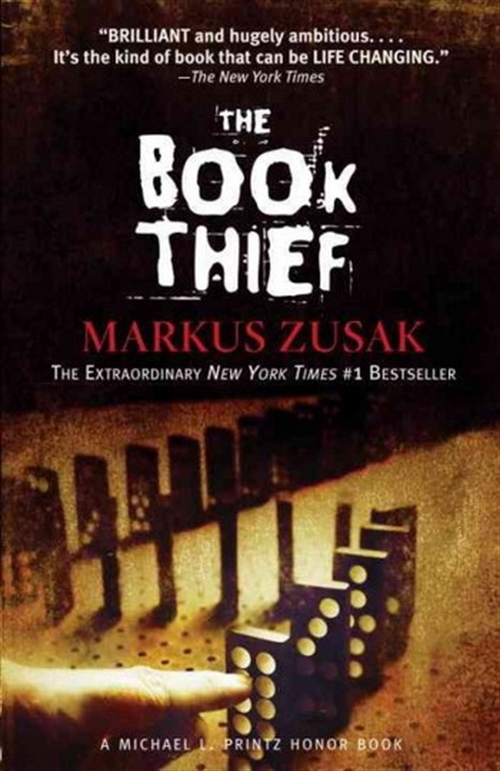 I read The Book Thief last year and loved it. It was such a unique story- even though many books have been told about that era. I fell in love with the characters and found the book fascinating. Thanks for sharing! I just love the characters I meet in books about war because they are usually so strong. I connect with them a lot easier. That's exactly how I felt. I also think I will never forget this book. Death as the narrator really just drew me in and his little tidbits just had me wanting more and more. I agree, it is definitely more of a book to savor. The depth and odd life-like feeling it gives is so worth it! A must read. It really is an emotional book. It's one I'll never forget. I have this on my must read list and, since the move earlier this year, it sits in a box waiting to be rediscovered. Good review!